(CNN) -- Jorge Lorenzo's gamble on tires paid off as the Fiat Yamaha rider won the French MotoGP at Le Mans on Sunday to take over the world championship lead from team-mate Valentino Rossi. 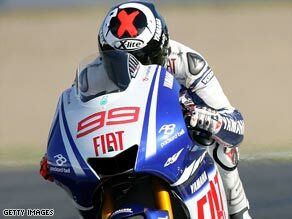 Lorenzo's decision to stay out on wet-weather tires proved decisive in his French MotoGP victory. But the real shock was second place for the Hayate Racing machine of Marco Melandri, who put his Ducati and Kawasaki nightmares firmly behind him. Melandri struggled to be competitive on the Ducati and also thought he might not be racing this season when Kawasaki pulled out of MotoGP. However, a compromise deal struck by Kawasaki and series rights holders Dorna resulted in the Italian racing on machines supplied by the Japanese manufacturer and run under the Hayate Racing banner. Melandri repaid the team with a fine second place behind Spaniard Lorenzo, who had stayed out on the drying track with a bike running wet-weather tires longer than most of his rivals. Lorenzo's team-mate Rossi had gone in early to switch to his second bike with slick tires but paid the price as he slid off and then visited the pits several times, including once for a ride-through penalty for speeding in the pit lane, to get his tire selection right. Behind Lorenzo and Melandri were Repsol Honda duo Dani Pedrosa, who started on pole position, and Andrea Dovizioso, with the Ducati Marlboro machine of Casey Stoner in fifth. Chris Vermeulen (Rizla Suzuki) was sixth, Colin Edwards (Monster Tech 3 Yamaha) finished seventh and Vermeulen's team-mate Loris Capirossi was eighth. Edwards' team-mate James Toseland finished ninth and Toni Elias (San Carlo Honda) 10th. Rossi could only finish 16th and failed to score a championship point, leaving the defending champion one point behind new leader Lorenzo in the standings and tied in second with Stoner on 65 points.